Making art and jewelry out of dried pasta is a ubiquitous kids' craft. 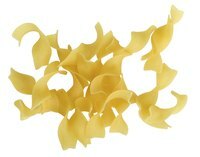 One method of dyeing pasta uses rubbing alcohol, which renders the pasta inedible. But color also can be added to your child's macaroni necklace by dyeing the dry pasta with food coloring and vinegar. That way, not only can you use vinegar-dyed pasta for crafts, you can cook with it, too. Food coloring reacts with vinegar to stain the pasta bright colors while still leaving it completely non-toxic. Place up to 12 dry noodles in a plastic sandwich bag with a zipper seal. Add 1 teaspoon of vinegar to the sandwich bag. Add five drops of food coloring to the bag. Close the baggie and shake it vigorously for 45 seconds or until the noodles are dyed to the shade you want. Unzip the sandwich bag and fold the opening over so that the noodles are exposed to air. Allow the noodles to dry completely, which can take up to one hour depending on the climate. Empty them onto a plate before working with them, as the dye can still stain surfaces. The food coloring will stain your hands when you work with dyed noodles. If you want to keep your hands free of dye, wear latex gloves.